The year and the new century got off to a great start for us, as well as for BILL WILSON of Missoula, MT. 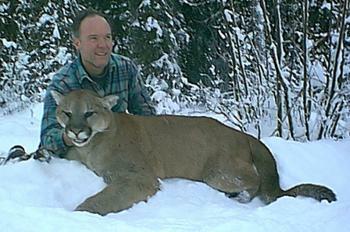 Bill took this terrific cougar on New Year's Day. TROY WESTMEYER of Minot, ND, came for his first visit to Alberta in January. Troy's dad, Ray, also came along to observe the hunt. The snow conditions were less than ideal, but hard work paid off. Troy took this tom on day nine of his hunt. 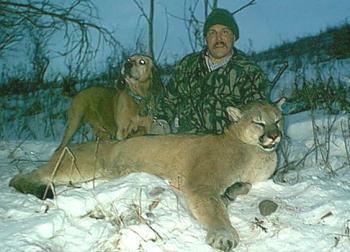 TERRY WALKER of Edson, AB, is pictured here with Rebel, a prominent member of the Double Diamond Outfitters cougar hunting team. 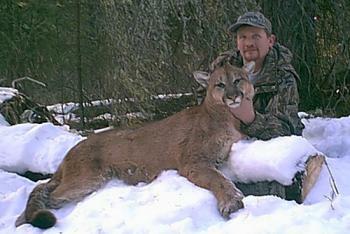 Terry definitely had luck on his side, as he took this great cat on the first day of his hunt. 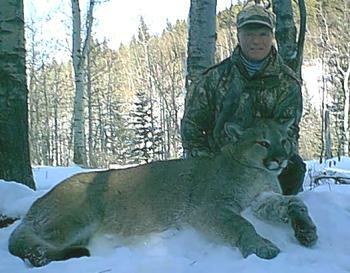 Persistence paid big dividends for our longtime friend TOM BUDD of Calgary, AB, who, after passing on a couple of cats during previous hunts, was able to connect on this big tom in February of 2001. MIKE CIAVARDONE and MIKE PITSIKOULIS made the trip up from Lakeland, FL, to join us on a Pronghorn Antelope/Mule Deer combination hunt during the first week of October. Mike C was lucky enough to take the best Antelope of the week with this beautiful 16" buck. Mike also took a 4 point muley buck on the sixth and final day of his hunt. Not to be outdone, partner Mike P took his antelope on opening day and followed with this mountain monarch during the mule deer hunting portion of the trip, later in the week. Needless to say, both Mikes went home happy! 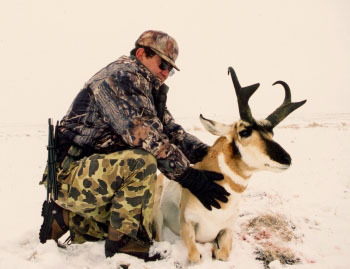 Also joining us on the first antelope hunt of the year was GREG MICHALKO of Buffalo, MN, who purchased his hunt at the fund raising auction during the Safari Club International Convention in January, 2001. 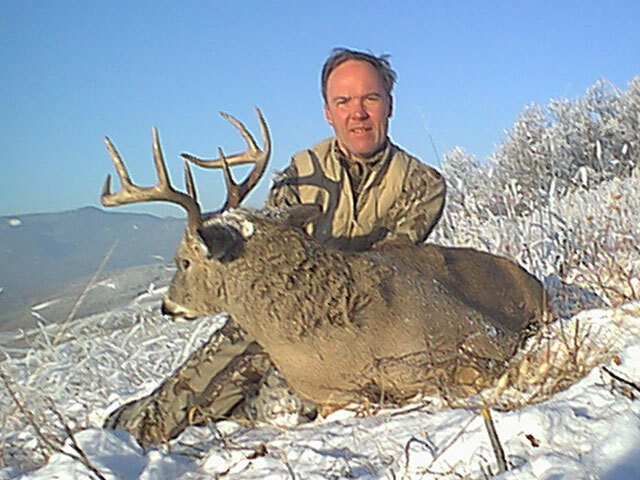 We extend our thanks and appreciation to Greg for his ongoing support of SCI and Double Diamond Outfitters. Our second Pronghorn Antelope hunt of the year took place in late October. An early snow turned the prairies white, and made it difficult to avoid the cactus while making a stalk! TOM WOODSON of Blackrock, Arkansas, made a great shot to get this heavy horned, big pronged buck. AILTON CARVALHO of Florianopolis, Brazil, traveled a long way to make his dream of hunting antelope come true. He went home smiling after scoring on this heavy 15" Pronghorn. Ailton is now looking forward to another Alberta adventure, perhaps to hunt prairie mule deer. Opening day for our prairie deer season was a big success with all three hunters in camp tagging muleys before days end. KARL HAGADORN of Queensbury, NY, made a great shot, taking this fine buck at approximately 350 yards. JEFF CORIGLIANO of Seattle, WA, has hunted with us a number of times, becoming a good friend along the way. On previous hunts he has taken moose, deer and antelope. This time he opted for a prairie mule deer hunt. It was a great pleasure to hunt with Jeff again and share in his success. Jeff scored on this high and heavy mule deer on the first morning of our prairie deer season. MARTIN HARRINGTON, owner of Marty's Sports and Gunsmithing in Bennington , VT, hunted with us for the first time this year. When Marty got his chance, he made it count, getting the third of the three bucks taken that day. Once again, DON SELBY of Orem, UT, joined us in Mid November. 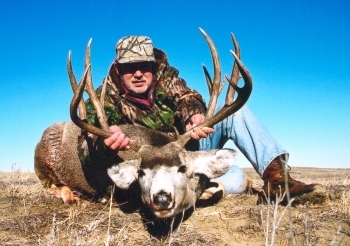 This time he came seeking a fine prairie muley which he took on the second day of his hunt. Don is a good friend who will be joining us when we head to Sonora, Mexico in January. 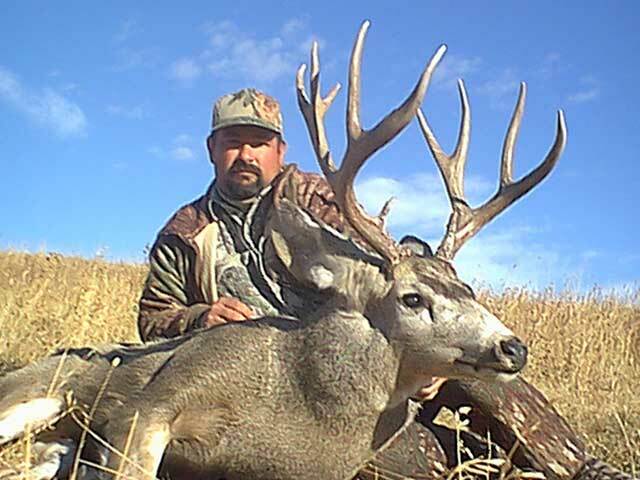 We will be hunting Desert Mule Deer and Coues Deer with Ubaldo Lopez of El Rodeo Hunting Lodge. MARK HONIGSBERG of Mahopac, N, took this fine prairie buck after hiking several miles and many coulees. TROY WESTMEYER, who took a cougar with us in January, returned in November to spend Thanksgiving in search of a trophy Alberta Mule Deer. As you can see, Troy had some great success in Alberta during 2001, and we're glad to have played a part. Sometimes outfitters can fit in a day of hunting for themselves. This prairie whitetail was taken the same frosty, foggy day as Troy's muley above, with a 140 grain Barnes X bullet from a .280 Remington. BILL WILSON, who started out the year with his New Year's Day cougar (see the top of the page), returned to Alberta in November to try his hand at a mountain deer combo hunt for the last 5 days of the month. Day four was one of those spectacular November days that only a deer hunter can fully appreciate, producing this magnificent mountain muley. This was one of two great mule deer bucks we saw that day. The next day was the final day of the season. Bill made a great shot, harvesting this ridge top whitetail buck at just over 300 yards. Bill is now a Barnes X convert, having taken each of these bucks with a 140 grain "X" bullet from his .280 Remington. Thanks to everyone who joined us in 2001 and made the year another memorable one for us. Congratulations to those whose success we were lucky enough to share. Andre Couture, Cresten Andersen, Darren Daniel, Dan Fieldberg, Eldon Hoff, Heide Bowyer, John Gordon and Tony Kondel.